A theme in forex markets (as well as on the Forex Blog) is that as the Dollar has declined, virtually every other asset/currency has risen. The rationale for this phenomenon is that the global economic recovery is boosting risk appetite, such that investors are now comfortable looking outside the US for yield. However, this market snapshot may have to be tweaked slightly, in accordance with a recent WSJ article (Sterling Looks Ready to Join the Sick List). According to the report, “Similar to how investors sorted good banks from bad banks earlier this year, foreign-exchange buyers are starting to sort strong currencies from weaker currencies. The pound appears to be joining the dollar in the weak camp. Both countries have near-zero interest-rate targets, an aggressive policy aimed at boosting the economy, and yawning deficits.” In contrast, the article continues, the Yen and the Euro have risen, as have so-called commodity currencies. 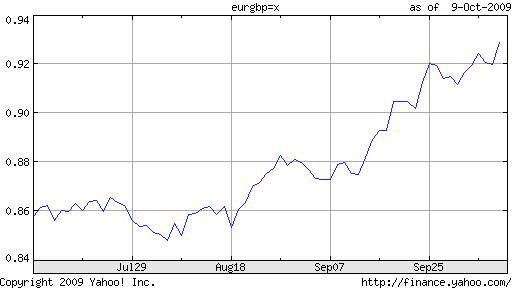 While there’s no question that British economic and forex fundamentals are abysmal, it’s a bit hard to understand why the markets are picking on the Pound now. After all, the Euro, Swiss Franc, and Yen, for example, are plagued by some of the same fundamental problems: growing national debt, sluggish growth, low interest rates, etc. Investors can borrow in Yen nearly as cheaply as they can borrow in Dollars or Pounds, and the Bank of Japan is likely to keep rates low at least as long as the Bank of England (BOE), if not longer. Meanwhile, price inflation remains practically non-existent, which means that any capital that investors stash in the UK should be safe. The government meanwhile has demonstrated a certain ambivalence when it comes to the program. 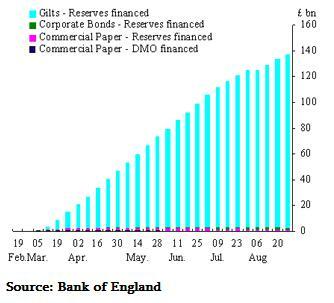 The head of the UK Debt Management Office indirectly encouraged the BOE to continues its purchases of bonds, for fear that stopping doing so could cause yields to skyrocket and make it difficult for the government to fund its activities. “A rapid sell-off could create a downward spiral of gilt prices which would make life harder for both it and the DMO.” On the other hand, one of the leaders of Britain’s conservative party – which is projected to take office after next year’s elections – has criticized the program on the grounds that it will lead to inflation. From the BOE’s standpoint, it’s a no-win situation. Continue the policy, and you risk inflation and further invoking the ire of politicians. Wind it down, and you could tip the economy back into recession. For better or worse, it seems the BOE will err on the side of the former: “If we stopped supporting the economy now it would crash. Every country in the world and just about every informed commentator is saying the same thing. The job is not finished.” Given that inflation is projected to hover around 0% for the next two years, the BOE still has some breathing room. As for the charge that the surfeit of cash flowing into markets is weakening the Pound, ‘So be it,’ seems to be the attitude of Mervn King who suggested that, “The weaker pound was ‘helpful’ to efforts to rebalance the British economy toward exports.” While he backtracked afterward, it still stands that the BOE hasn’t made any efforts to stem the decline of the Pound, and is at best indifferent towards it. Objectively speaking, then, it makes sense to call the Pound sick. Still, many other currencies are just as sick. I guess the perennial lesson is that in forex, everything is relative. Today’s comment by a senior BoE official sent the Pound upwards. But in general, it sure is a sick currency.